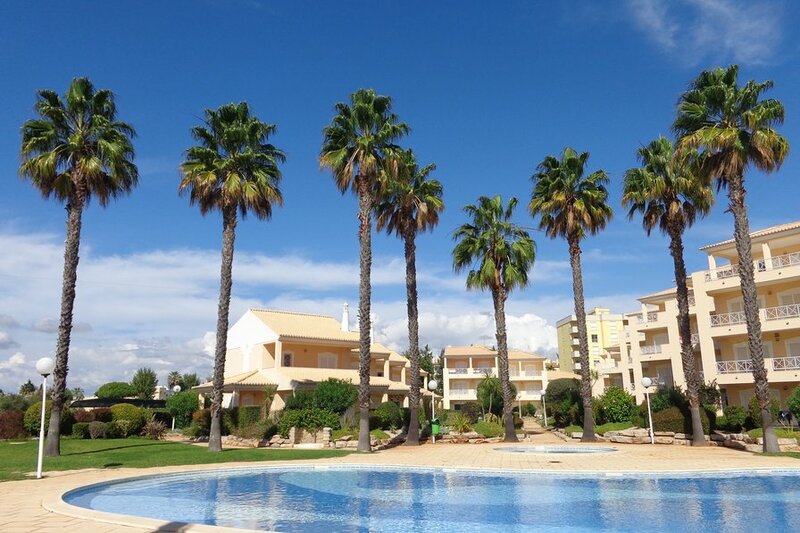 Townhouse in a closed condominium with pool, 2 bedrooms (2 suites) and Air Conditioning for a maximum occupancy of 6 people, located in Vilamoura 2 km from the beach and the Vilamoura´s Marina. This cozy and well equipped townhouse is well decorated, situated in a condo with a beautiful, exotic garden and 2 swimming pools which are a bit away from the habitations for a peaceful and quiet stay. 2 Bedrooms; 2 Bedrooms in Suite of which one is furnished with a double bed and the other with two single beds. The bedroom with the double bed has direct access to a balcony. The Loft was converted into 2 more small rooms, no window but with natural light, each of these bedrooms are furnished with a single bed. 2 bathrooms, 2 shower rooms (2 bathrooms in loft) and 2 bath with two sinks and window. Living / dining room with direct access to the covered terrace, equipped with Satellite TV and DVD player. Fully equipped kitchen with dining area, electric oven, 2 electric discs, 2 with gas and a built-in grill, fridge freezer, washing machine, dishwasher, microwave, toaster, juicer, blender, electric knife, portable electric grill, coffee machine (filter) and iron. Covered terrace furnished with 2 sun loungers, a dining table with 6 chairs and a portable grill (Weber) with all utensils. Marina de Vilamoura: 2km | Beach: 2.5 km | Supermarket: 200m | Restaurant: 200m | Bar: 200m | Papershop: 200m | Golf: 1km | Airport: 25 km | Albufeira Centre: 12km | Clinic: 2km | Theme park (Mini Golf ): 2km | water park: 6km (Aqua Show).